John Bercow, the Speaker of the House of Commons, championed the progress of LGBT rights since the 1980s in a speech at the London 2018 Gay Games reception on Monday night. Although his role as Speaker requires him to act impartially, he made his own personal views clear as he spoke of his views on the commitments that all major parties had made to LGBT rights in recent years. Mr Bercow said: “By comparison with a decade ago, and certainly by comparison with 15 years ago, and even more by comparison with 20 years ago, our country, the United Kingdom, is a vastly more inclusive and respectful place. That seems to me to be a huge tribute to those of you who campaigned for recognition and for equality and for respect. And I think it is, if I may very politely say so, a huge tribute to those in parliament over the last 15 years, including from the very top of government, who brokered for real change. I don’t think I compromise my impartiality between the parties if I simply acknowledge the fact that much of the progress of the legislative kind took place during the period of last government. “A decade or more ago, in fact it was 13 years ago, I told a friend of mine that after due reflection I couldn’t see any good reason for the statutory discrimination in the ages of consent for heterosexual people on one hand, and gay and lesbian people on the other, and that I was moved to vote for the equalisation of the age of consent, which I did in February 2000, and that I thought it was probably a good idea to speak in the debate. This very good friend of mine strongly counselled me in the best possible spirit and with my best interests in mind against doing so. 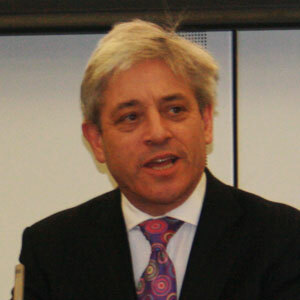 Mr Bercow is well known for campaigning for LGBT rights in the UK and around the world. He has previously pushed for gay rights in the Commonwealth and launched the gay rights group Kaleidoscope trust.